Manila - ABS-CBN, the leading TV network in the Philippines announced that more than 100 of the biggest and brightest personalities in the country will unite for a meaningful Christmas celebration via Solidarity Concert titled “Kwento ng Pasko, Pag-asa at Pagbangon: The 2013 ABS-CBN Christmas Special” to be held on Tuesday, December 10 at Smart-Araneta Coliseum, Cubao, Quezon City. ABS-CBN’s annual Christmas special-turned-fundraising event will feature Kris Aquino, Vice Ganda, Judy Ann Santos, Sarah Geronimo, Anne Curtis, Angel Locsin, Piolo Pascual, Coco Martin, John Lloyd Cruz, Bea Alonzo, Daniel Padilla, Kathryn Bernardo, Julia Montes, Enrique Gil, Jodi Sta. Maria, Richard Yap, Kim Chiu, Xian Lim, Gerald Anderson, Lani Misalucha, Martin Nievera, Gary Valenciano and Lea Salonga. Also gracing the concert are Abra, AiAi delas Alas, Aiza Seguerra, Alex Gonzaga, Angelica Panganiban, Angeline Quinto, Arnel Pineda, Bamboo, Boy Abunda, Charice, Cristine Reyes, Denise Laurel, Diether Ocampo, Doris Bigornia, Empress, Enchong Dee, Erich Gonzales, Erik Santos, Jake Cuenca, JC De Vera, Jed Madela, Jericho Rosales, Jessy Mendiola, Jovit Baldivino, Julia Barretto, Karylle, KZ Tandingan, Mitoy Yonting, Nikki Gil, Sam Milby, Shaina Magdayao, Toni Gonzaga, Vina Morales, Yeng Constantino, Zanjoe Marudo and other Kapamilya stars. Similar to the sold-out “ABS-CBN Presents: Tulong Na, Tabang Na, Tayo Na! An All-Star Benefit Concert” last November, the proceeds of the ‘Kwento ng Pasko’ Solidarity Concert will be donated to go to the Sagip Kapamilya Calamity Fund of ABS-CBN Lingkod Kapamilya Foundation that continues to help rebuilding the lives of survivors from various calamity-stricken areas in the country. Ticket prices are as follows: P300 for general admission; P400 for upper box B; P500 for upper box A; P700 for lower box; and P1,000 for patron. Tickets can now be purchased at the Araneta Coliseum office, Ticketnet outlets, and Ticketnet website (Ticketnet.com.ph). All ticket buyers will be given free-sized #TulongPH T-shirts that will be distributed in the venue during the concert. ABS-CBN encourages us to continue taking part in rebuilding lives of Kapamilyas affected by calamities by wearing “Tulong Shirts” which are still available through authorized dealers nationwide. For more details, please visit ABS-CBNnews.com/TulongPH. "Everyone is encouraged to send their messages of hope for the calamity survivors. Simply take a picture of you holding your personal message wearing the “Tulong Shirt” and post it on Facebook, Twitter and Instagram with the hashtag. ", ABS-CBN said. Don’t miss the fun-filled, meaningful Christmas in “Kwento ng Pasko, Pag-asa at Pagbangon: The 2013 ABS-CBN Christmas Special”on December 8. Show starts at 8pm. 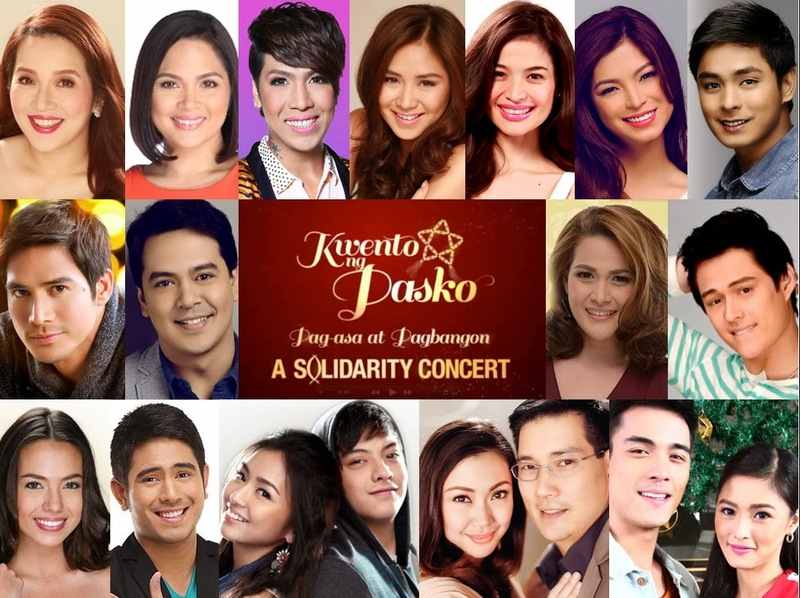 For additional information on the ‘Kwento ng Pasko’s Solidarity concert, visit ABS-CBNnews.com/TulongPH.